By any measure, this is an odd Psalm choice for Advent, the season of light. 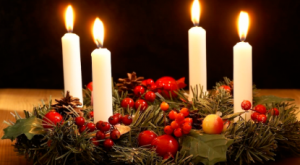 During Advent, we light candles to celebrate hope, peace, joy, and love. During Advent we sing beautiful music, bake cookies, and buy gifts. We spend time with our families and anticipate with excitement the birth of Christ. This Psalm is…not about any of that. This Psalm is about war. It’s about death. It’s about an enemy people so depraved that they devour each other as easily as they eat bread. David writes that these evildoers know neither love of, nor fear of, God. This is a scary Psalm. This is a disturbing Psalm. This is a Psalm about real life. We don’t have to look very far to see evil in our world today. David decries the people who commit atrocities against one another as easily as they eat their daily bread. We know this type of evil. It’s the evil we see when someone takes an automatic weapon and shoots us a school, or a nightclub, or a synagogue. David writes about people who are “overwhelmed with dread” and fear, even when there is nothing to fear. To me, that sounds a lot like politicians ripping toddlers away from their parents and tear-gassing babies, claiming it’s to protect “national security.” And David reminds us that none of us is blameless, for all humankind has at one point condoned evil acts, whether those acts are committed by our friends, our families, our elected officials, or our very selves. This is all starting to sound a bit dark. But that’s what makes this Psalm such #RelatableContent and so crucial to understanding the of Christ’s birth. In naming this evil, this Psalm sets the stage for everything good about Christmas, because it reminds us why we need Jesus in the first place. God, sometimes it feels as though there is no one who does good. Not even one. Sometimes the weight of our problems and the suffering of the world are too heavy to bear. When we watch the news, listen to NPR, or read Twitter, we see that people seem to be devouring each other as if they were eating bread. We struggle to believe that our long-expected Jesus is really coming. We fail to the do the work of bringing your Kingdom to earth because, sometimes, the problems feel too impossible to solve, the tears too numerous to dry, the hatred too deep to penetrate. Hear us, God, when we cry out to you. Help us, in this holy season of Advent, to have faith that salvation is indeed coming soon.